The University of West Florida archaeology program recently identified the archaeological site of the Luna settlement – the first multi-year European settlement in the United States – in a developed neighborhood in Pensacola. The artifacts discovered are evidence of the Spanish settlement by Tristán de Luna y Arellano from 1559 to 1561, the earliest multi-year European colonial settlement ever archaeologically identified in the United States. 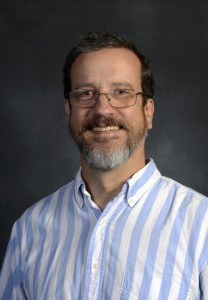 The work began on Oct. 2, 2015, when Pensacola native Tom Garner discovered Spanish colonial and Native American artifacts at a privately owned residential lot within view of the two uncovered shipwrecks in Pensacola Bay, which were also linked to the Luna expedition. In 1983, Garner attended a UWF archaeology field school led by Dr. Judith Bense, founder of the UWF archaeology program and current University president. Garner is well versed in the identification of historical artifacts and aware of areas considered likely candidates for the location of the Luna settlement. 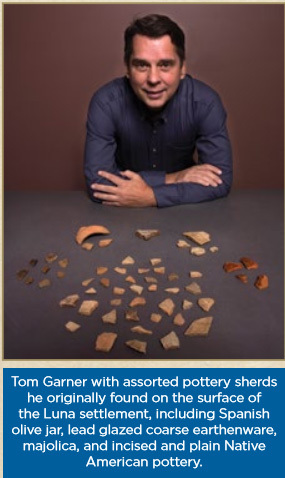 After multiple visits and surface collections, Garner brought the artifacts to the UWF archaeology lab on Oct. 30, 2015. Dr. John Worth (left), associate professor of historical archaeology, is an archaeology and ethnohistory expert and focuses on the Spanish colonial era in the southeastern U.S.
With the cooperation and support of residents and property owners, UWF began test excavations at the site and recovered additional artifacts in undisturbed context. Worth is the principal site investigator and Dr. Elizabeth Benchley, director of the UWF archaeology program, provides administrative and financial support. Garner also recently joined the team as a research assistant and neighborhood liaison for the project. 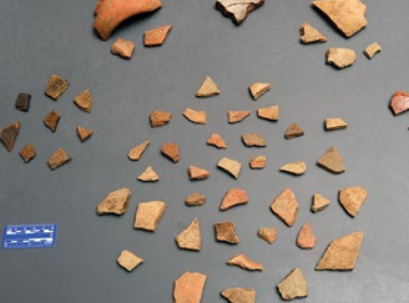 UWF archaeologists recovered numerous sherds of broken 16th century Spanish ceramics found undisturbed beneath the ground surface. They are believed to be pieces of assorted cookware and tableware, including liquid storage containers called olive jars. Small personal and household items were also among the findings – a lead fishing line weight, a copper lacing aglet and wrought iron nail and spike fragments. Additionally, the team recovered beads known to have been traded with Native Americans. These items are consistent with materials previously identified in the shipwrecks offshore in Pensacola Bay. The artifacts were linked to the Spanish expedition led by Tristán de Luna y Arellano, who brought 1,500 soldiers, colonists, slaves and Aztec Indians in 11 ships from Veracruz, Mexico, to Pensacola to begin the Spanish colonization of the northern Gulf Coast in 1559. One month after they arrived, the colony was struck by a hurricane, sinking many of their ships and devastating their food supplies. After two years, the remnants of the colony were rescued by Spanish ships and returned to Mexico. The Luna settlement inhabited Pensacola from 1559 to 1561, which predates the Spanish settlement in St. Augustine, Florida, by six years, and the English settlement in Jamestown, Virginia, by 48 years. The winter encampment of Hernando de Soto’s Spanish exploratory expedition to Tallahassee, Florida, from 1539 to 1540, is the only earlier European habitation site positively identified by archaeologists in the southeastern U.S. Two earlier Spanish colonial settlements have yet to be found – those of Juan Ponce de León near Fort Myers, Florida, in 1521 and of Lucas Vázquez de Ayllón near Brunswick, Georgia, in 1526. However, neither settlement lasted more than a few weeks. The discoveries made at the site of the Luna settlement signify that the two shipwrecks previously discovered in Pensacola Bay were wrecked at the anchorage for the entire Luna fleet. The first shipwreck was discovered by the Florida Bureau of Archaeological Research, and the second was found by UWF. The second shipwreck is currently being excavated by UWF with the assistance of a Florida Division of Historical Resources Special Category Grant. This new information about the location of the settlement may help UWF archaeologists narrow the field of search for the remaining shipwrecks. The UWF archaeology program includes a select group of 13 full-time professional archaeologists, nine support staff and numerous graduate students. The program has a rich history of significant instruction, research and public outreach in the Pensacola region. Exhibits displaying UWF research and Pensacola area archaeology are open to the public at the UWF Archaeology Institute, T.T. Wentworth Jr. Florida State Museum and Destination Archaeology at the Florida Public Archaeology Network Coordinating Center. Experiential learning is a key component of undergraduate and graduate education at UWF. Each summer, the archaeology program offers multiple 10- to 11-week field school sections – like the one Garner attended in 1983 – during which students receive hands-on experience and develop skills necessary for employment. The University plans to include the Luna settlement site in field school sections led by Worth in Summer 2016. In order to protect the neighborhood and the integrity of the site, the UWF archaeology program does not plan to disclose the exact location of the Luna settlement. I found this fascinating. I just retired as an Elementary Ed Teacher, and I wish I had this information prior to now. What a find for the University of West Florida, and history buffs everywhere!!! Great job. “de” is Spanish for of or from. “de Luna” of or from the moon. Great news! I hope they will stop the “Luna” and refer to this properly…”De Luna”. History proven! Pensacola City of Five Flags! Such Exciting News !!! My grandmother always said “de Luna settled here first! !” She would be so excited!!! It was my grandmother that took me to the site in 1983 !!! It was history in the making!! I am so happy to say I was there!! So PROUD all of their success !!! All that time and dedication has paid off!!!! I remember the Quadri-centennial in 1959 when we celebrated de Luna. Why does he lose the “de”.